A Led lamp has been exclusively designed with the purpose of giving the highest lighting quality to Mona Lisa painting. This new design has been financed by the (well-known) Japanese firm Toshiba. The new lamp has been installed in a shelf designed by the room’s architect (Lorenzo Piqueras, 2005) . This system works upwards and is composed of 34 LEDs (single chip and multi chips. It replaces the former 7 LED lamp that had been working since 2005. Three optical systems have been developed in order to obtain high illuminance uniformity on the painting: primary optics on the LEDs, a “Scheib” mixing the colours, and a third system consisting of a double lens with an integrated filter, focusing the light on the painting and regulating its quality. A framer was also incorporated. The other aim of this lamp is to control freely the colour temperatures, keeping a high CRI (>95) with a maximum Gamut Area (in relation to the scientific research of the International Lighting Commission). This is realized without producing any infrared or ultraviolet radiation. 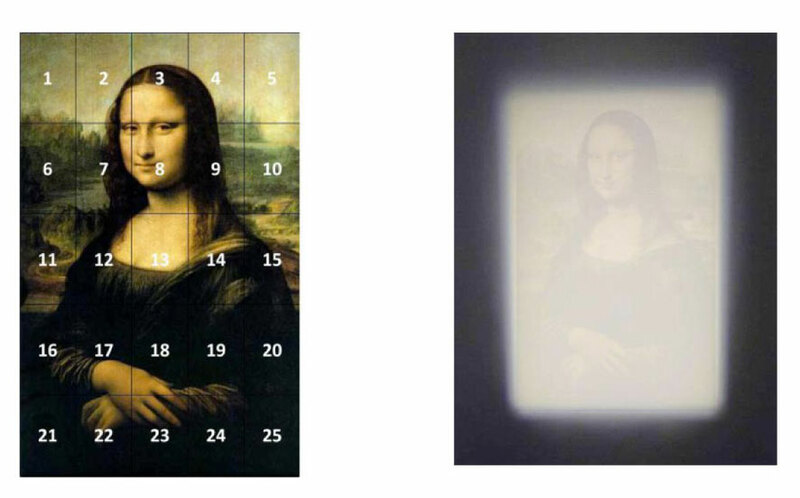 A smart command system has been developed in order to allow Louvre Museum to adjust the spectrum of the light (deviation Duv) with an easy and precise process.. These changes are mainly useful for adjusting the coloration caused by both the protection glass and the surrounding luminous environment in order to obtain the best rendering . Finally, the lamp benefits from an extremely powerful cooling system which stabilizes the colours mixing and offers a life time of 80.000 hours. Thanks to the use of the last LEDs generation, this lamp consumes only about 20 watt when operating. As a part of the patronage of Louvre Museum from Toshiba, it has been decided to develop a new lamp with very high performances in order to add a complementary lighting to Mona Lisa painting. A special development team was gathered together. The company ARKANZ managed the development of the product and this document presents the solutions developed by the team. This new lighting equipment was installed on 4 June 2013. 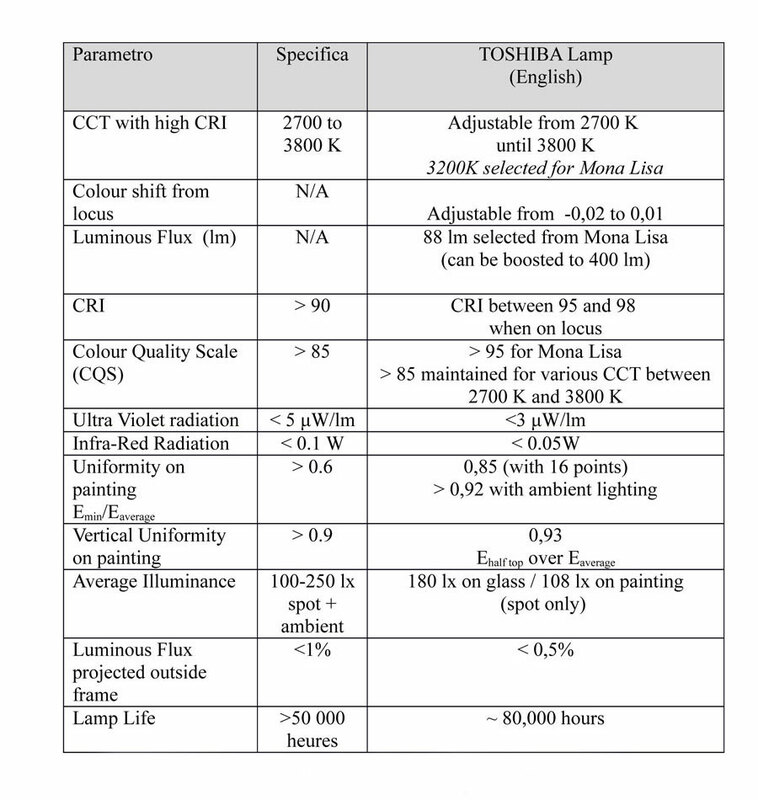 Figure 1: TOSHIBA lamp 2013 with 34 LEDs designed to light the painting of Mona Lisa. Original lighting principles and functional requirements of the new lamp. In 2005, Architect Lorenzo Piqueras was in charge of the renovation of the “ La Joconde Room” at the Louvre and Marc Fontoynont was responsible for the lighting. It was decided that the painting of Mona Lisa should not have been lighted in an ostentatious way but should have been lighted as closely as possible to the neighbouring paintings. The painting position on a specific wall and behind a thick plate of laminated glass required a lighting system able to provide colour adjustments that needed to be added.The upward lighting from the shelf allowed the lamp to be hidden in order to avoid risks of reflections. In the renovation process that took place in 2005, we realized that a lighting system based on multiple LEDs could efficiently provide the optimal chromatic corrections (optimal rendering of colours, compensation of coloration due to the thickness of the glass plate, and the need to take into account the surrounding lighting). By designing a LED lamp, short enough to be inserted in the shelf ,was a major constraint. The lamp designed in 2005 was composed of 7 LEDs and had already been subjected to a detailed colorimetric study. A state of the art lamp that draws on the best available technology and know-how. The first lamp developed for La Joconde in 2005 by Sklaer GmbH (an Arkanz affiliate) – in partnership with Fraen Corporation Srl and DEF Srl – had 7 LEDs, a FOCON type colour mixer-converter (Fibre Optics Converter), and an active cooling system using a permanently functioning fan. Each channel was driven individually in constant current. It operated for over 70,000 hours without failure. The development of the new lamp, managed by Arkanz Lighting in close cooperation with TOSHIBA Lighting, has called for innovative technological solutions: 34 LEDs are positioned in a star configuration in order to ensure chromatic homogeneity across the painting. 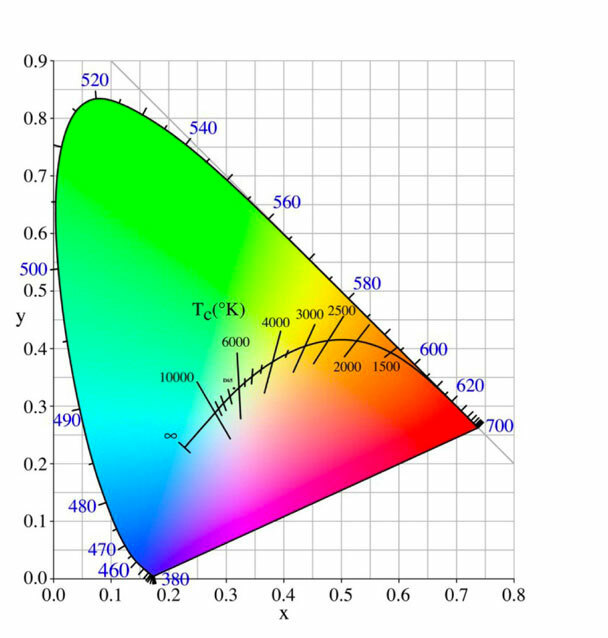 The spectral distributions of the LEDs have been carefully chosen in order to achieve a very high Colour Rendering Index (CRI) of up to 98 on the required temperature colour range. The cooling of the lamp is ensured by a massive copper heat sink in combination with a fan to limit the chromatic variations as much as possible and to guarantee the spectrum over the required life time. One of the major challenges was to mix colours over a very short 12cm distance. This was made possible by Partner Company Fraen srl integrating a Scheib optical fibre mixer in the mixing and projection optical system. (See following articles). The current driving system has been designed by the company DEF srl (Lombardy, Italy). DEF was also responsible for the assembly and the quality management with UL International Italy. Two D-LED Push type constant current DALI drivers have been used for colour mixing and interference free dimming. The Push is a very compact multi channel current driver specially adapted for LEDs lamps; it has with a DALI or 0/10V interface and an overheating control loop. The configuration software (WINCIP) has been modified to integrate a colorimetric module; this module can automatically set the levels in the 7 groups of LEDs modules once you have chosen the following three parameters: colour temperature, luminous intensity and deviation from the black body locus. AELSYS has developed an application on Windows 8 to link the CP64-LX-C with a Toshiba tactile PC/Tablet, via Wifi or an USB3 link. With this „concept lamp ” Arkanz Lighting and its partner companies have studied and implemented a number of technological solutions that are the subject of patents and open the way for new powerful and high-performance museum projectors. Optical optimisation for an excellent uniformity across the painting. 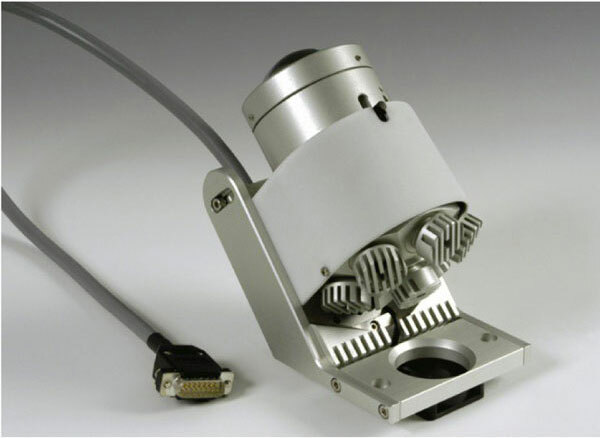 In the former 2005 LED lamp model, the projection lens was a single aspheric lens with a 0,8 numerical aperture. The shape of the beam was created using a fibre optics converter with a trapezoidal output whose rectangular projection coincided exactly with the painting of La Jocund. For the new 2013 LED lamp, the main multi-sources structure has been retained although the spatial distribution has been improved, to increase the homogeneity of both colour and intensity. The number of LEDs has been increased from 7 to 34, set up as 7 “single-chips” and 3 “multi-chips” each one consisting of 9 chips. 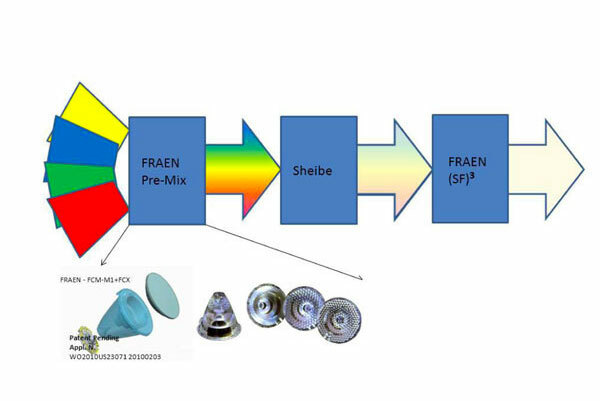 The first “pre-mix” step is based on specific FRAEN optical components for LED colour mixing (FRAEN – FCM-M1+FCX Patent Pending Appl. N. WO2010US23071 20100203). The third step uses a special (SF)3 diffusing filter. Figure 5. Details of the colour mixing optical train that guarantees lighting uniformity across the screen. A “Pre-mix” optical system allows the beam from the 34 LED-source to focus on a disk that creates a high-homogeneity luminous spot. The dimensions of the luminous spot are optimised in relation to the size of the La Jocund painting. Downstream of the “Scheib” mixer we have chosen to position a trapezoidal cut-off diaphragm in the focal plane of the projection system. This allows a rectangular-form spot to be projected on to the screen plane which is not orthogonal to the optical axis of the lamp. The former lamp used an aspheric single projection lens. The new lamp is equipped with a special-design aspheric-symmetrical doublet. This doublet has a Numerical Aperture of 0.7. 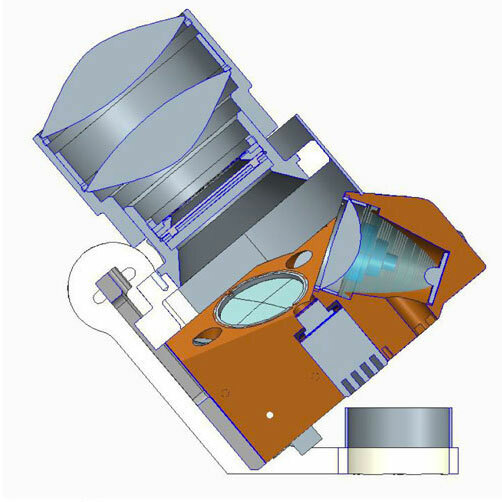 The design of this new two-lens system was necessary to eliminate the distortion on the upper side of the asymmetrical projection of the beam. This resulted in obtaining a very well defined rectangular spot on the painting. Furthermore, a careful fine tuning of the system offers the possibility of monitoring the contrast between the illuminated part (the painting) and its frame. Figure 6. Asymmetric projection doublet guarantees uniform light distribution properly shaped on the screen. 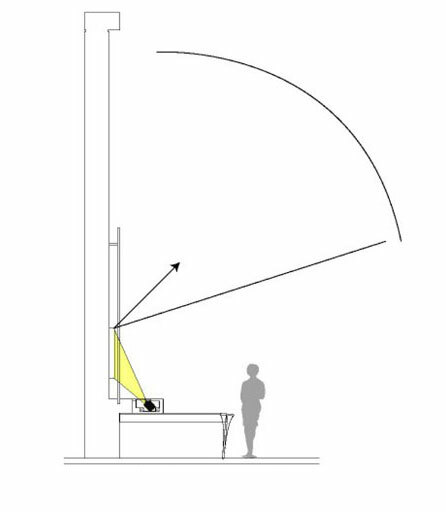 To manage the luminous fade from the illuminated area to the dark area, the team decided not to light up the frame but to make a slightly fuzzy “cut-off edge” to create a “soft” profile. The uniformity of the screen lighting is one of the most noticeable spot performances of the model 2013. Since the lamp optical axis forms an angle of approximately 60 degrees with the normal of the painting plane, the risk was to have the lower part significantly brighter than the upper part. To avoid this problem, in addition to the pre-mix, the Scheib and the doublet systems, it was necessary to develop a further special filter, named (SF)3, to balance more precisely the distribution of light on the painting. This (SF)3 filter can be designed for a wide variety of angles of incidence along both X,Y directions and for different optical specifications. Figure 7. The light measurements on the painting show a uniformity of 0.85 with the lamp alone) and 0.92, taking the environmental light into account. Colour mixing of 34 LED sources in the new spotlight for Mona Lisa is carried out by means of the device that enables the spotlight size to be reduced. It represents a fibre-optic parallel-sided plate (“Scheib”) and uses the same principle of operation as in the FOCON of the previous spotlight, but with more sophisticated diaphragms. It consists of a 4 mm thick bunch of optical fibres with both a high fill factor and a high numerical aperture. 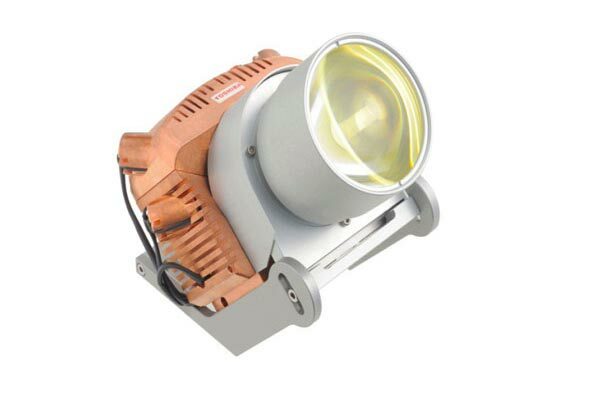 The big aperture (0.5) allows LED modules to be arranged in a wide cone of + / – 32 °. By testing this device, it has been shown that a very high quality of colour mixing takes place there, and as a result of that the uniformity of illumination would run close to 95 %. The fibre-optic plate (“Scheib”) is used for light beam transmission and image shaping when an application demands precise light distribution in small space. 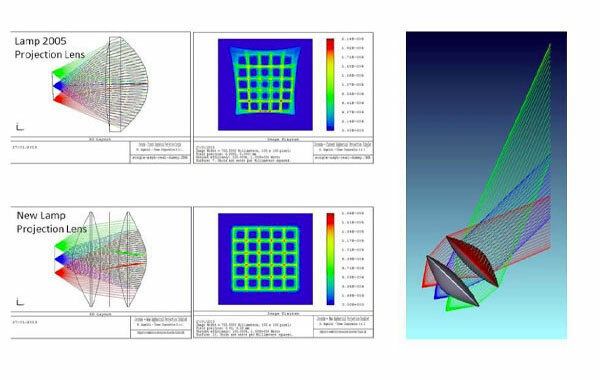 This elegant technology is successfully used for shaping a mobile light beam pattern in original headlight designs and is the subject of the patent application submitted by Pharos-Alef Ltd. and Sklaer Gmbh (patent N 2283986). Two different pilot modes were suggested: the first one dedicated to colorimetric adjustments before the final on-site delivery and the second one for current operations, interfaced with DALI protocol used in the Louvre. The first aspect was particularly relevant concerning the innovation. We have designed a colorimetrical tool, in line with the ongoing research of the International Council of Museums (ICOM) and the International Lighting Commission (CIE). This tool allows us to navigate in the colorimetric space, to freely control the chromatic coordinates of emitted light while disposing at any time of a light with an optimal quality (high Colour Rendering Index and maximal Gamut Area). The development of this software has required spectral calibration of each colour channel and correction due to optical systems by using an integrating sphere. However, the conservation Department of the Louvre Museum had to make final decisions concerning these adjustments; we have elaborated a protocol for on-site adjustments, in front of the panting of Mona Lisa. The final adjustment has been decided by the curator, Vincent Delieuvin, assisted by the architect of the “La Joconde Room” Lorenzo Piqueras, under mixed general lighting conditions (fluorescent light with a little bit of natural light). It is essential to insist on the innovative process, allowing the curator to adjust the light and colours on a painting and to render the exact colours of the work with high fidelity as well. The process we elaborated would deserve to be in many museums, at least where the art curators would like to adjust the lighting: a) because of the deterioration of the painting, b) because inappropriate general lighting conditions that need a localised chromatic correction. Figure 9: The controlling system offers the highest quality of lighting for all the operating points situated on a wide range of temperatures. A high Gamut Area is reached with a large number of LEDs (34). The navigation on the diagram is made by the Ingelux designed pilot, based on established knowledge. The highest quality LED lamp in the world. Toshiba group started the new lighting activities in 2010 in order to create a new worldwide “lighting culture”. Within the framework of the first renovation project of lighting outside the museum, we signed a contract in partnership with Louvre Museum (from 30 June 2010 to 31 December 2013). The lighting of the Pyramide, the Pyramidions and the Pavillon Colbert were replaced by LED lightings on 6 December 2011, whereas the lightings retrofit (with LEDs) of the Cour Napoléon took place on 24 May 2012. Today, the work is progressing in order to deliver the lightings of the Cour Carrée by the end of 2014. This renovation project of external lighting is not limited to a simple technological supporting work but has maintained a worldwide cultural heritage in a “more sustainable and nicer way” in order to achieve the “fusion of arts and technology” and reduce the electrical consumption to 73%. Louvre Museum acknowledges that we have succeeded in combining the “reduction of environmental charges and the revalorisation of arts”. This explains why we could sign a new partnership contract on the renovation project dealing with the lighting of the interior of the Museum in May 2012. A series of lighting will be replaced by LED lamps, starting with the lights of Mona Lisa, called the treasure of the Louvre, followed by the ones in the “Red Room” where we find famous large-scale paintings (for example the Couronnement de l’Empereur et de l’Imperatrice). We will also replace the light situated at the entrance of the Napoleon Hall, more precisely at the entrance of the Museum. The specific lamp of Mona Lisa was expected to be replaced in June 2013, together with the luminaires of the Red Room whereas the lighting of the Napoleon Hall is expected to be renovated before mid-2014. 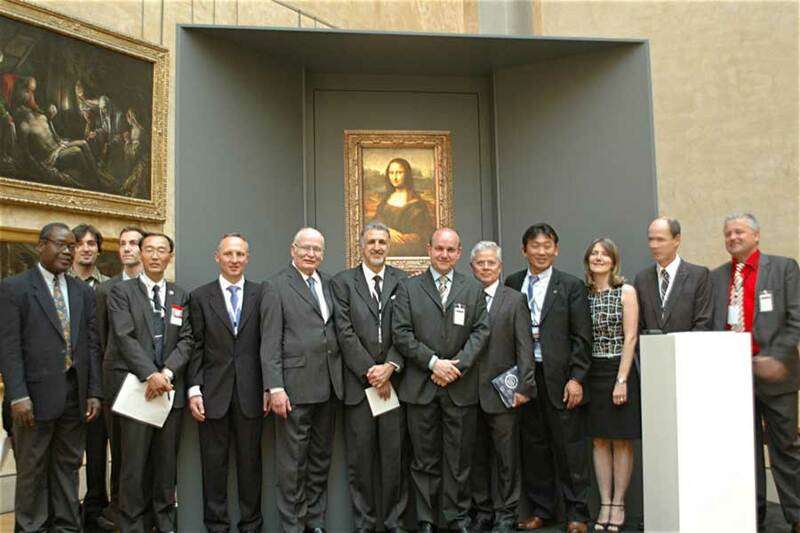 At the beginning, Toshiba planned to design a new lamp, to replace the specific lamp lighting Mona Lisa and developed in 2005 by the German company ARKANZ-SKLAER in partnership with Fraen Corporation Srl and DEF Srl. Toshiba has decided to develop an innovative lamp, based on the latest technology of LEDs by benefiting from progresses in optics. 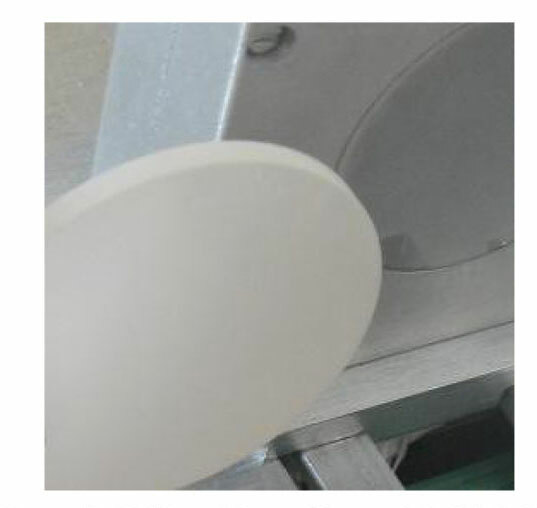 It launched a project to gather together the best available technologies to develop a lamp of the best possible quality. Close monitoring of the technical team. investigate technical solutions to improve lighting uniformity on Mona Lisa as well as uniformity of spectral distribution over the painting. Identify ways to limit drastically any UV radiation and Infra-Red production. Statement by the Curator of the XVI century Italian Paintings, Louvre Museum. In Louvre Museum, particular attention is paid to the lighting so that every object of art receives the proper lighting. Each painting deserves to be looked at in the best conditions of lighting, which might be useful to understand the pictorial technique of the artist or to admire the subtlety of his palette. However, the lighting has to adapt to multiple constraints. For example: time could have deformed the structure, altered the pigments or damaged the varnish. Furthermore, the glass protection of certain pieces of art, necessary for their security, can disturb the visibility if the surrounding space reflects into the glazing. More or less all these constraints are present and in the case of Mona Lisa in a very acute manner. Over the past 500 years, the wooden panel has lost its shape and taken a convex form. As a result, a complex network of cracks has appeared, damaging the subtle work of Leonardo da Vinci. The different coats of varnish laid down on the painting oxidized, darkened and yellowed the colour range. Finally, the protective glazing, particularly thick for this painting, has added a coloured filter, which lighting has to compensate. We are delighted that the painting has benefited from the latest innovations in the lighting domain, thanks to the partnership with Toshiba. This approach is part of the spirit of experimentation and the spirit of Leonardo de Vinci. The building of Louvre Museum is in permanent change. Even today, the special design of the new lamp for Mona Lisa is the result of an interactive collaboration between renowned specialists. If a new modern spot for Mona Lisa was designed for the reopening of the Salle des États in 2005, today it is. Thanks to Toshiba’s involvement, famous specialists gather together again. We are delighted to present today the painting showing the benefits of the latest lighting technology. The authors are thankful to Jean-Louis Bellec, Chief of Service at the Architecture Department of Louvre Museum, for his careful project supervision and his active participation in the exchanges. Kazuaki Makita, Chief Specialist, New Lighting Systems Division, Toshiba, Tokyo, Japan. © 2004-2017 Opificio della Luce - Tutti i diritti riservati. E' vietato riprodurre il contenuto di questo sito senza autorizzazione.